When the mining robot moves on its turn, it pulls with it any creatures grabbed by it. The creatures remain grabbed, and this movement does not provoke opportunity attacks from the grabbed creatures. Hit: 1d10 + 6 physical damage, and the mining robot pulls the target 1 square and grabs it. No more than two creatures can be grabbed at once. Hit: 1d10 + 6 physical damage. Effect: Each creature grabbed by the mining robot takes 2 physical damage and knocked prone. They are placed in a square adjacent to the target and no longer grabbed. Requirement: It is the mining robot's turn. Effect: The mining robot takes an extra standard action during that turn. It's difficult to imagine that once this hulking, utilitarian robot was pristine out of the factory. Now it is coated in grime and ore-dust. 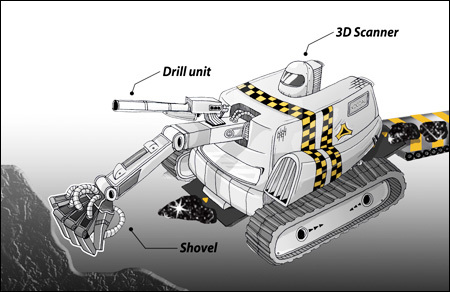 Whilst not designed for combat, the mining robot is robust and strong so can be pressed into service if their mining installations come under attack. They are slow, but useful for blocking corridors. If they can engage intruders close to ore-processing facilities, they will attempt to carry grabbed intruders to the crushing machinery and dispose of them. Hit: 1d8 + 4 physical damage. Hit: 2d6 + 3 photon damage. 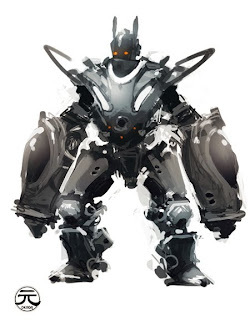 Trigger: The sentry robot is hit by an attack from an enemy that is not adjacent to it. Effect: (Immediate Interrupt): The sentry robot gains a +2 bonus to all defenses against the triggering attack, and each creature adjacent to the sentry robot takes 5 electric damage. Whilst the Sentry Robot Model 2510 is in test mode, inserting pens, coffee tokens or other small items into the laser barrel is forbidden. Sentry robots are not particularly mobile, being designed to defend key points. They are little more than repositioning sentry guns. This particular model was manufactured by Main-Comp, and is ubiquitous within its installations. In addition to a head-mounted laser gun and sensor array, it may activate an shock shield when under fire. Hit: 1d8 + 4 physical damage and the target is grabbed. Hit: 1d10 + 3 toxic damage and the target takes a -2 penalty to attack rolls (save ends). First Failed Save: The target cannot see further than 2 squares (save ends). Hit: 1d10 + 3 toxic damage and the target is dazed (save ends). Effect: The target is knocked prone. Requirement: It is the zorbotron's turn. Effect: The zorbotron takes an extra standard action during that turn. This hulking humanoid robot raises its arm and... *Ff-Ponk* A small metal sphere sails through the air and smashes at your feet. Funny... you were expecting an explosion. What's that smell? The Zorbotron is a riot-control robot. It uses gas bombs to pacify groups of humans, relying on thick cerametal plates to ward off the mob. Under normal use, that's where its role ends: A less scrupulous owner (or crazed computer) may have programmed a zorbotron to commence mashing the dazed crowd with its heavy robot claws. The slaver cannot drop prone or fall prone. Creatures take a -2 penalty to escape the grab of a slaver, and the slaver gains a +2 bonus to Strength checks made to move a grabbed target. Hit: 2d6 + 3 photon damage and the target is grabbed. Hit: 1d6 + 3 photon damage and the target is slowed until the end of the slaver's next turn. Trigger: A creature escapes from the slaver's grab. Effect: (Immediate Reaction): The slaver makes a las-whip snare attack against the escaping creature. These pyramid-shaped robots were designed by Main-Comp to enslave mankind. They often work in conjunction with zorbotrons, using their las-whips to keep subjects in place whilst gas-bombs numb them into submission.